In the defence resolution of 1936 it was decided to organise one new fighter and four new bomber wings. 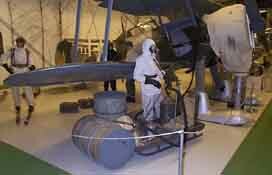 The fighter wing was for the defence of the Stockholm area. 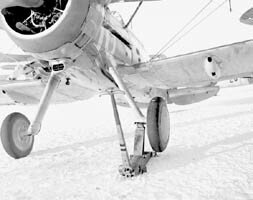 The head of the Swedish Airforce found the Gloster Gladiator best suited for the demands. 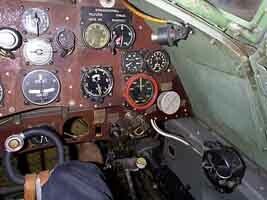 Two squadrons in the wing should get planes from England and the third should get license-manufactured planes. The type was called J8 (J stands for Jaktplan, i.e. fighter). 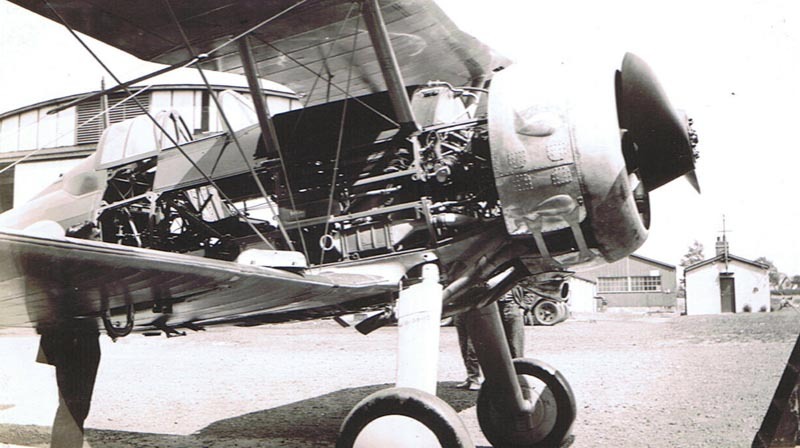 The first squadron of Gladiator was organised on F8 Barkarby (F stands for Flottilj, i.e. wing) and was received with mixed feelings since the planes where new but obsolete. 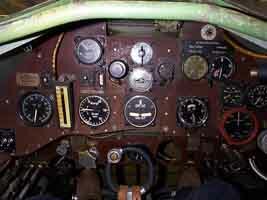 The first flight of the plane was back in 1934 and more than 500 had been delivered to the RAF. 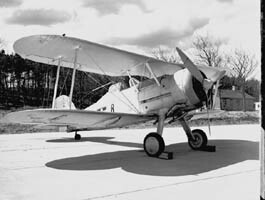 The biplane configuration meant great turnability but the top speed wasn't good compared with modern fighters of the day. The first J8's had a Bristol Mercury VI with 645 hp, but the successive version (J8A) had a Mercury VIII with 840 hp. 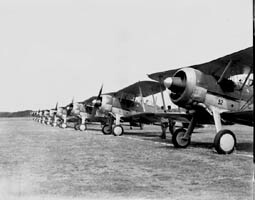 Increasing demands on performance meant that the J8 soon was declared obsolete as a front-line fighter and was relegated to the Air Cadet School F20, to be used as a trainer for singular and formation training. 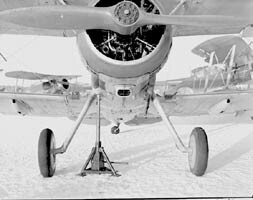 Swedish J8 Gloster Gladiator on skies. Engine:________J8 - Bristol Mercury VIS2 / 645 hsp. _______________J8A - Bristol Mercury VIIIS3 / 840 hsp. Two images of Gladiator no. 235 (F8-5). 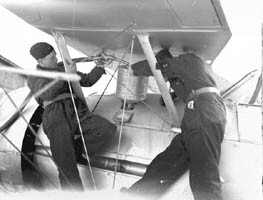 The photos are taken on 21 April 1938 and show the aircraft with the old crown marking (m/37). Click on the images to see them in full size. Left: A division (Squadron) of Gladiators. The image is taken on 17 July 1938. 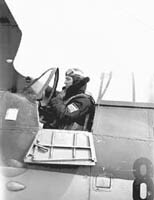 Left: Överste (Colonel) Bengt Nordenskiöld (later General and commander of the Swedish Air Force 1942-1954) in a Gladiator. The image is taken on 13 April 1939. 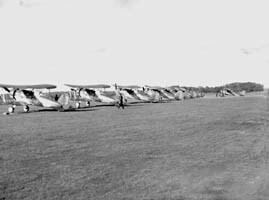 Right: Gladiators photographed at an air-show on 9 July 1939. Gladiator no. 269 prior delivery at Gloster Works in 1937. Image kindly provided by Rennie Cafley. 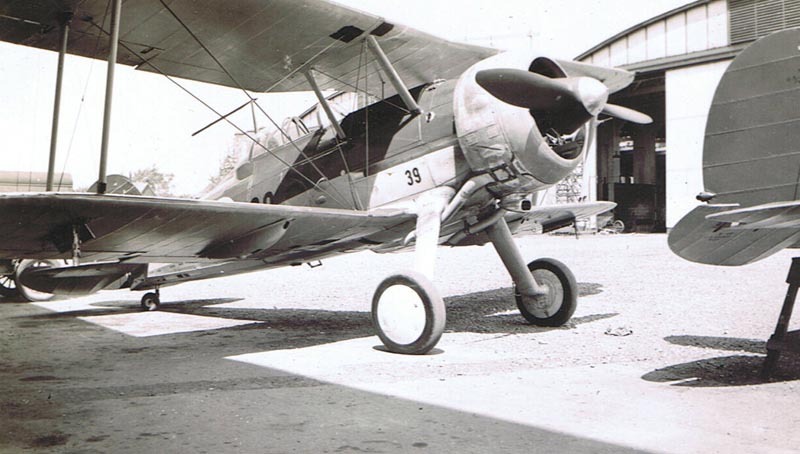 Swedish Gladiator prior delivery at Gloster Works in 1937. 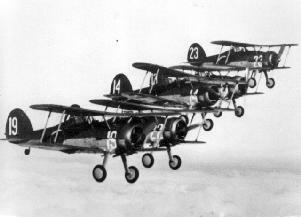 Gloster Gladiators in the Swedish Air Force. 268 09/06/38 F8-38 Aircraft used by F19 in Finland as yellow “I” or “J”. 271 30/05/38 F8-41, F10-18 Aircraft used by F19 in Finland as yellow "A". 274 25/06/38 F8-44 Aircraft used by F19 in Finland as yellow "D". 275 09/06/38 F8-45 Aircraft used by F19 in Finland as yellow "C". 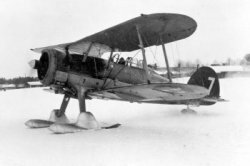 17/01/40 1 I-15bis claimed by fänrik Roland Martin of F19 at Märkäjärvi-Salla. 276 09/06/38 F8-46 Aircraft used by F19 in Finland as yellow "L". 278 09/06/38 F8-48, F10-23, F16-83 Aircraft used by F19 in Finland as yellow "H". 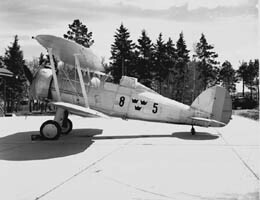 279 25/06/38 F8-49 Aircraft used by F19 in Finland as yellow "G". 281 25/06/38 F8-51 Aircraft used by F19 in Finland as yellow “B” or “E”. 282 05/07/38 F8-52 Aircraft used by F19 in Finland as yellow “B” or “E”. 283 05/07/38 F8-53, F10-25 Aircraft used by F19 in Finland as yellow “I” or “J”. 284 05/07/38 F8-54, F10-26 Aircraft used by F19 in Finland as yellow "F". 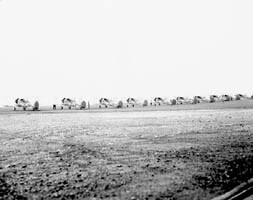 12/01/40 1 I-15 claimed by fänrik Ian Iacobi of F19 at Märkäjärvi. 17/01/40 1 I-15bis claimed by fänrik Per-Johan Salwén of F19 at Märkäjärvi-Salla. 285 05/07/38 F8-55, F10-27 Aircraft used by F19 in Finland as yellow "K". Please note that the first code was made with marking rules from 1937 (m/37) and the following was made with the rules from 1940 (m/40). Lifting jack Typ 1 (model no. 1). The photos are taken on 11 January 1944. 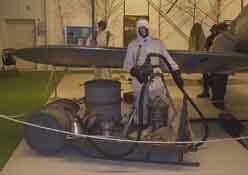 Left: Refuelling of a Gladiator. The image is taken on 21 April 1939. 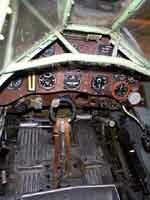 Right: Engine start. The image is taken on 15 April 1939. 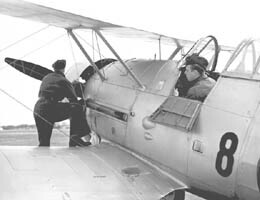 Flottilj (Wing) use of the Gloster Gladiators in the Swedish Air Force 1937-46. The summary is from 1 July each year. 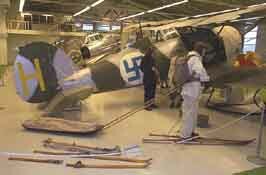 The J8 (#278 F9-H) at the Swedish Air Force Museum is marked with Finnish markings because twelve J8's was part of the voluntary Swedish Air Force Unit, F19, during the Winter War between Finland and the Soviet Union in 1939-1940. 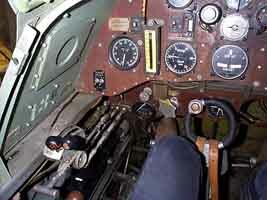 Cockpit images of the Swedish J8 Gloster Gladiator preserved at the Swedish Air Force Museum at Malmslätt. Details of winter equipment used on the Swedish J8 Gloster Gladiator preserved at the Swedish Air Force Museum at Malmslätt. Sleigh for transporting fuel-barrels and fuel-pump. 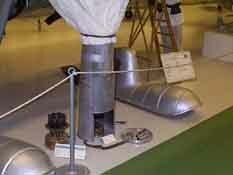 Kerosene-burner with cover for engine heating. In the foreground is an example of the two-part skis carried as emergency equipment in the Gladiators. Additional information kindly provided by Alex Crawford, Pertti Lehto and Andrew Thomas.